Ruth Goodman is one of my favourite historians, and I've enjoyed watching her in the following documentary series: Tudor Monastery Farm, Victorian Farm, Edwardian Farm, Wartime Farm and Full Steam Ahead. In How To Be a Tudor: A Dawn-to-Dusk Guide to Everyday Life, Ruth covers every stage of the day: sleeping, when to rise, washing, dressing, breakfast, education, dinner, men and women's work, leisure time and activities, supper and bedtime. Goodman packs a punch into these 300 pages and her experience as a living historian is impressive. I especially enjoyed the social etiquette section, and in particular the section about walking and posture. Goodman says that today we can guess someone's nationality from their gait, and in the Tudor period you could guess someone's occupation from the way they walked. Ruth goes on to outline the preferred posture of the era and even touches on the differences wearing ruffs and lace cuffs made to posture and bearing. I'd never considered ruffs other than presuming they'd be uncomfortable to wear, and discovered that they significantly effected the way the wearers stood, ate and held themselves. I also learned that starching a ruff can take an entire day and a white ruff was a versatile item of clothing thanks to the use of coloured starches. Yellow ruffs were worn, pale pink ruffs were worn by young boys, and blue starched ruffs were popular until they became associated with prostitutes and Elizabeth I declared that "no blue starch shall be used or worn by any of her Majesty's subjects." Page 78. How To Be A Tudor is full of interesting tidbits like this and I enjoyed them all. Did you know that a middle class woman could be wearing 1000 pins at any one time? And these pins are still being found in the Thames? Wow! 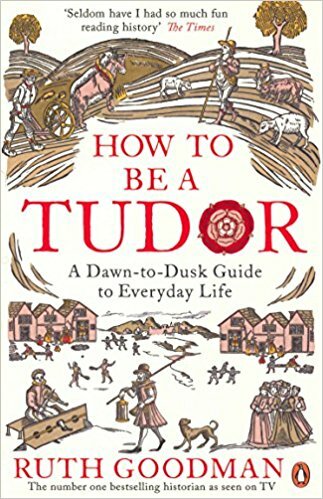 I thoroughly recommend How To Be a Tudor: A Dawn-to-Dusk Guide to Everyday Life by Ruth Goodman to readers with an interest in history, fashion, England and the Tudor period.